An amazing discovery about the Blue Ridge Parkway, with far-reaching cultural implications, has been publicly confirmed, Whispers and rumors have abounded for years, ever since the discoverer (your modest observer), in an unguarded moment several years ago, revealed his tentative findings. Since then, jealous rivals have been plotting to claim this discovery for themselves. This entirely unprofessional behavior has prompted your modest observer to publish his findings before thorough study of all its probable implications. It is expected that scholars from many fields will now rush to assist him in this rewarding task. Modern science has long marveled at the astronomical sophistication of ancient structures at such places as Stonehenge, Machu Picchu and Chaco Canyon, To that exalted list we must now add another, tentatively identified as Astronomical Site at the Little Switzerland Tunnel of the Blue Ridge Parkway or ASLSTBRP for short. Obtaining the proof at ASLSTBRP was fraught with hardship, typical of similar accomplishments of great note in history; Amundsen’s trek to the South Pole comes to mind. 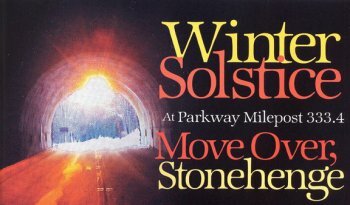 This section of the Blue Ridge Parkway is usually closed at winter solstice, forcing a hike in the predawn semidarkness of nearly one entire quarter of a mile, The gathering winds whip through the tunnel at speeds approaching 15 mph, The snow along the Parkway is treacherously slick and shows tracks of small wild animals lurking about. These hardships prevented rivals’ theft of credit for this shining accomplishment. ← Thanksgiving at the Switzerland Inn!